When they started the film project right from the beginning, the idea was to bring Kathy Hagan as makeup artist and costume designer into it so that they could amalgamate her ideas for anti-punk fashion and other ideas. 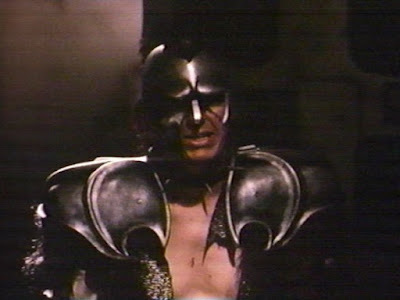 Ron told Kathy Hagan "Grab an idea and go with it", with the general idea of her throwing everything she could into it and this resulted in this curious armour for the character Splatter also with bat wing like shoulder armour, and a helmet with a mohawk hairstyle as well oddities such intravenous electronic speed system where all he does is push a button and then a vial of amphetamine/speed is automatically injected into his arm. His right arm is also hydraulic. The character is in such physical pain all the time that it's the only way he could keep himself going, and the machinery worked. The idea was that the killer was not just another demented psycho but was actually once a nuclear scientist who was very pro-nuke, but it came to a point where he lost his entire right arm in a nuclear accident. 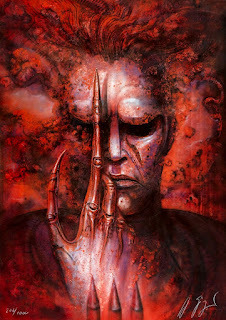 Ed Neal had Giger paint a rendition of his character Splatter and Giger created something loosely based on the photos that he saw. Giger had requested that they pay him cash, and when a man of that stature gives a list of such conditions and nothing seemed to outrageous, Ed thought it was best to say yes to everything because Giger was so wonderful. He thought that the fact that Giger was doing the poster was like a gift in the first place, and he had turned down work to do film posters for a lot of people, including 20th Century Fox. Since he was a fine artist, he didn't really need to do them but he seemed attracted to the film and one reason for this was the fact he liked Texas Chainsaw Massacre which shared a couple of the same actors. The other side to this from Giger's memory, whether the two sides can actually connect anywhere, was that Ron Moore, the director of Future-Kill visited a major retrospective exposition of Giger's work from April to June of 1984 that took place at the Seedamn Cultural Centre in Pfafficon near Zurich. It was the most complete showing of everything put together and Giger saw the irony that such a thing could only have been realised in this Orwellian year. 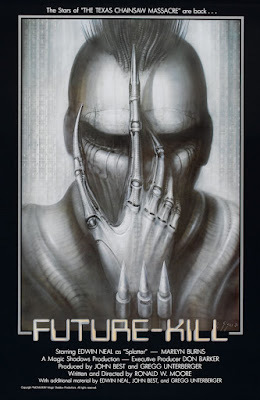 Just when Giger was not in the mood to be doing a new work and he wanted to recover from the resultant stress of the exhibition, Ron Moore who representing the film company showed up quite desperate to have him to a key art poster for their film called "Future Kill" which he had just finished directing and so it was being edited at the time. He said that he had to have the poster and right away! Giger felt that his only means of escape from this situation would be to pretend to be sick. This drove Ron into quite a state of despair. From this situation, Mia Bonzanigo would come to recount a conversation with Ron wherein he tearfully confided to her that he would not return to his movie associates without the poster from me. It looked as if he has promised them too much. Finally Giger gave in to Ron's tears. Ron also showed Giger a couple of photographs of a character with a skull-like head of the character "Splatter" which looked to Giger as if it had been stolen from one of his own works, perhaps even one of his masks, adapted to fit over Ed Neal's head and since they had done it so well, Giger thought that he might as well do the poster. Giger found Kathy the designer to be attractive, and would soon find himself enjoying sashimi together in bed with her. Giger spent a furiously busy week creating a red and grey version of the desired poster. As soon as he was finished, Ron disappeared with his loot. Giger didn't even get a chance to make reproductions of them. Ed Neal went to see HR Giger in Switzerland to pay him for the poster design that he did for Future Kill and also to get some limited edition posters signed. He planned to stay a couple of days but that turned into somewhere nearer to two weeks. He found Giger to be one of those fascinating men in the world, seeing reality in a very unobvious way, and soon others would manage to finally get around to seeing his way and say "Oh yeah". He thought also that part of his talent was down to there being a Swiss ability to line things up no matter how many layers there are and still see underneath them, and they've been doing it for many years with tiny little mechanical things such as watches. No matter how many bolts and nuts that they cram in there, they still know it's going to fit, and this was something that the Americans have great trouble with. With that poster, Ed was able to book the film into a lot of theatres that wouldn't have touched it because it had no major star. But based on the art of the artist who did Alien, the cinemas knew that they could get a crowd in. So they were saying to him ‘We'll take it based on the poster alone" which didn't say much about the movie industry. When they couldn't afford to pay him the money that they owed him for the film they said "Well, take these posters and sell them and you'll get a bit of money that way" which Neal did. Because of the popularity of the poster, in fact Ed Neal made more money off the poster than the film alone having printed thousand copies of both the red and grey version of the poster. Giger heard about this success. He also saw the finished film about half a year later. While the film was perhaps not for him, he at least thought it was very colorful in contrast to his near enough black and white poster and he liked the colours of the movie because they reminded him of a 1959 Brazilian film called Black Orpheus. 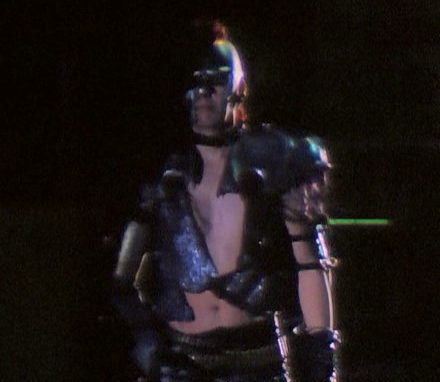 Splatter in his beautifully lit armour in "Future Kill"
CFQ: In 1985 you designed the poster for FUTUREKILL. Did you have anything else to do with that film? Gavin Baddeley: Could you tell me something about your meeting with H.R Giger? Ed Neal: I went to see him in Switzerland to pay him for the poster design for Futurekill. He did a wonderful, wonderful rendition of me on the poster and we were able to book the film into a lot of theatres that wouldn't have touched It because It had no major star. But based on the artwork by the guy who did Alien they knew they could get a crowd In. So they said ‘We ll take it based on the poster alone" which doesn't say much for the movie Industry. I made more money off the poster than I made off the film. Gavin Baddeley: How did that work out? Ed Neal: Well, they couldn't afford to pay me all the money they owed me so they said "Well, take these posters and sell them and you'll get a bit of money that way". 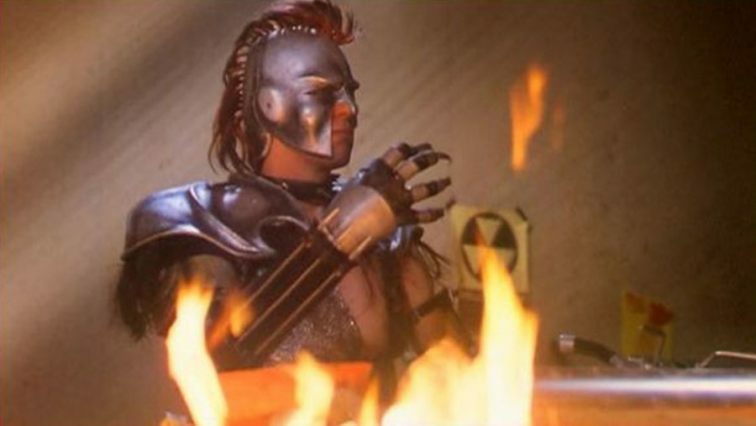 Well the film became so culty and Giger's artwork became so culty that I actually made more money selling the posters than doing the film. But that's the reason we did it in the first place: we knew his artwork would attract interest in the film. He had requested we pay him in cash. A man of that stature gives you a list of conditions and if there's nothing outrageous you say yes to everything because he's so wonderful. It was a gift that he was doing it in the first place because he turned down a lot of Important people to do film posters, like 20th Century Fox. because he's a really fine artist and he really doesn't need to do them. But he was attracted to this and he loved Texas Chainsaw Massacre so that's one of the main reasons he did Futurekill. Gavin Baddeley: Marilyn Burns is In Future Kill too Isn’t she? Ed Neal: Yes. Marilyn was in Texas Chalnsaw and I asked them to write her a part into the film because I thought If we appeared together then "the stars of The Texas Chainsaw Massacre are back" and did another bit of publicity off that, then that'd probably work real well. Gavin Baddeley: What’s H.R. Giger like? EN: H.R. Giger. Hans Rudi Giger. Is one of the most fascinating men In the entire world. I was supposed to stay a couple of days, I think I stayed two weeks. The man is absolutely fascinating: before you die you must either meet him or visit his home. He's definitely not like us; he's very, very special. He sees things In a way that others cannot see them until he sees them that way and then they go "Oh yeah" It's that real kind of Swiss ability to line things up no matter how many layers are there and still see underneath them. And they've been doing it for years and years and years with little tiny mechanical things that, no matter how many bolts and nuts they get crammed In there, they still know It's going to fit. I don't know what it is about the Swiss mind that they can do that, but I'm telling you there's a whole lot of other minds that have trouble; particularly American ones, because we can't see things in that many layers and Giger and a great many of the Swiss people have no problem with It whatsoever. He started out as an Industrial designer. Gavin Baddeley: I’d like to see some of his buildings. Ed Neal: You can’t believe how integrated. now he cannot conceive of anything unless It's a combination of machine and person, he can't separate the two any longer. You do know he drew the alien long before the film. This guy Ridley Scott just stumbled across this and went "Wow!" and wrote the script to the drawing. Once they saw the Image and were led to that Image they just completed It. Gavin Baddeley: He's done quite a bit of religious stuff; like a whole series of Satan paintings. Ed Neal: Well. he has been accused many, many times of being a satanist - he is not. It's just that he grew up in a very strange environment where underneath the homes they were all connected to these catacombs of the 14th-15th century church where all these bodies were buried just in great big mounds of heads and skulls and bones. It was a very strange kind of 15th century religious notion. He's not a satanist; he likes the occult In that It's fascinating. But this is not a guy that wants to cut body parts up. he chuckled Inwardly whenever It was brought up. He's fascinating and he's strange and he's wonderful but there's nothing demonic at all about him. He's actually a very warm very Inspired kind of guy. Wherever he looks he sees things differently, that's all it is. He's a fascinating man.you'd have to see In his home the panels that he's brought in and airbrushed. some of the pieces six and seven years at a time. They're like ten foot by eight foot. Just huge panels where he's just airbrushed. All you can think of is "I want to take this home with me". Of course none of them are for sale. well probably would see. If you gave him 300 grand or something. but he's Just no desire to part with them. He's not an avaricious guy at all. He's typical of a lot of artists who are very content with what they do. There is apparently a story behind the poster artwork. 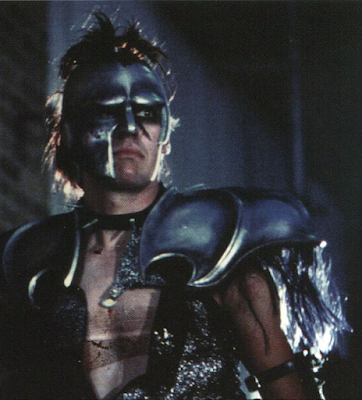 What's your final word on who got HR Giger involved?